Last August, 888Poker ran a mini buy-in tournament series called the Summer ChampionChips to coincide with the start of the Olympic Games in Rio. Such was the success of the series that the site is re-running the promotion once again from next Sunday. Similar to last year, the series consists of eighteen tournaments over eight days of action and guarantees a total prize pool of $150,000. Also similar to last year, you can qualify for the events for free via a series of freeroll satellites. The freeroll satellites are already taking place and continue until next Saturday. Any player who has made a real money deposit into their account is eligible to play in the freeroll satellites. So, if you fancy winning your share of the Summer ChampionChips prize pool, make sure you visit 888Poker today. The Summer ChampionChips kicks off next Sunday (July 23rd) with three superb sporting-themed events. The action kicks off at 4:30pm (all times GMT) with a $5.00 buy-in 6-Max “Opening Ceremony” guaranteeing $5,000, with the later action consisting of a $25,000 guaranteed “Half Marathon” at 6:00pm (buy-in $12.00) and a $1,500 guaranteed “Race Track Turbo” at 7:30pm (buy-in $1.00). 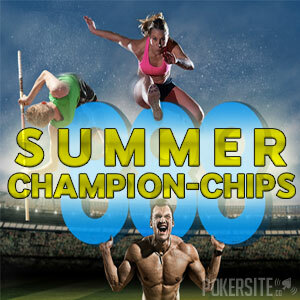 From Monday through Saturday, two Summer ChampionChips events are scheduled each evening at 6:00pm and 7:30pm. These have a good variety of formats and include a $1,500 guaranteed PL Omaha “Synchronised Swimming” tournament, a $3,000 guaranteed Knockout “Boxing” tournament, and a $30,000 guaranteed High Rollers “Weightlifting” tournament. The action draws to a close on Sunday July 30th with three further events including the $50,000 guaranteed Summer ChampionChips “Marathon” Main Event at 6:00pm, a $2,000 guaranteed “Freestyle Swimming” turbo tournament at 7:30pm and a $2,000 guaranteed “Sprint” super turbo tournament at 9:00pm. The full schedule for the Summer ChampionChips at 888Poker can be found here. As mentioned above, players who have made a real money deposit into their 888Poker accounts have the opportunity to qualify for free for tournaments in the Summer ChampionChips series via three-times-daily freeroll satellites. These take place each day at 12:05pm, 6:35pm and 11:35pm and award the top fifty players in each freeroll with a seat in the target tournament. There are no tickets to collect or missions to complete in order to enter the ChampionChips freeroll satellites; however, each freeroll satellite is capped at two thousand players, so it is important that you enter each event as soon as registration opens. It is also important to note that tickets won in freeroll satellites must be used to enter the target event as they have no exchange value. Over the eighteen events of the Summer ChampionChips, 888Poker is running a “Winners Gallery” leaderboard competition. The leaderboard is not just for winners, but for every player who takes part in the Summer ChampionChips series, as 888Poker will be awarding points in each event based on each player´s finishing position, the event buy-in and the number of players that take part in the event. There is a $1,000 cash prize up for grabs for the player who tops the leaderboard competition at the end of the series, plus another $2,000 in cash prizes and tournament entry tickets for the next 199 players. With twelve of the eighteen events having buy-ins of $5.00 or lower, the “Winners Gallery” leaderboard competition gives every player the opportunity to add a valuable prize to their bankroll.